Similarly, Missouri GOP Chair Ed Martin is in the Post-Dispatch talking about how the IRS "corruption" will galvanize the tea party. Their promotion of the issue by this pair is especially ironic considering that I documented, on multiple occasions, the St. Louis Tea Party publicly advocating their endorsement of Ed Martin in a Missouri Congressional race in violation of the rules governing 501(c)(4) organizations, which state that such organizations are not allowed to endorse candidates (see here, p. 7, first full paragraph) and communicate that endorsement to the public. But unless Carnahan supporters really do have their head down, it won't be hard to see through the intent of the billboard, which, if it sparks a legal challenge, could spell trouble for the Tea Party. As I noted at the time, there were other tea party actions that were not "straddling the line" (Wagman's phrase); they were clearly endorsing Ed Martin in a manner intended to communicate with the general public. 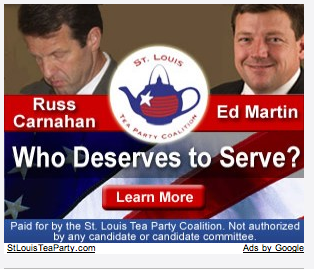 First, the St. Louis Tea Party posted advertisements around the web that led directly to a web page that stated "Ed Martin Deserves To Serve Instead of Russ Carnahan." They've deleted the original post now, but you can see it at the Way Back machine. 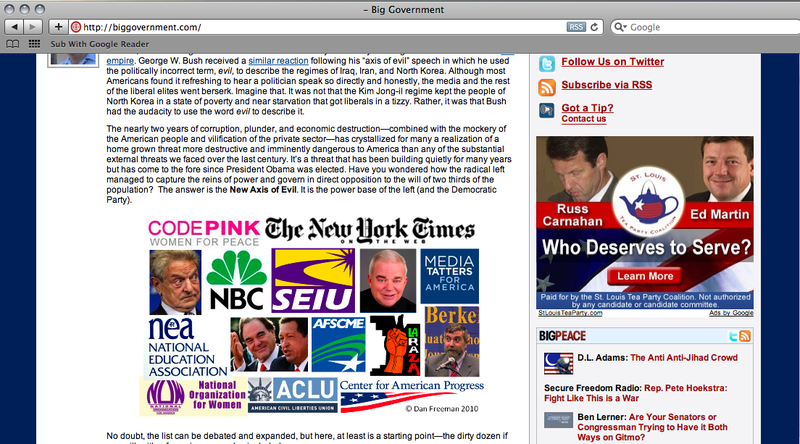 Similarly, here's a screenshot of an advertisement that appeared on Breitbart.com that states, "Paid for by the St. Louis Tea Party Coalition:"
I'm going to ask you to take one hour, just one hour, Monday or Tuesday, to come to the St. Louis Tea Party Headquarters at 4512 Hampton Avenue in St. Louis Hills, just south of Hampton Village, and give one hour to phone calls or knocking on doors asking your friends and neighbors, your fellow citizens to go to the polls on Tuesday and vote for Ed Martin and the tea party candidates across the ballot. The tea party also put up yard signs and attended rallies with signs that read "Taxpayers for Ed Martin" but included "St. Louis Tea Party" decals. It would have been very easy for them to simply use advertisements or signage that simply said, "Vote for the pro-liberty candidate (wink wink)." But they didn't. They deliberately flaunted 501(c)(4) rules by endorsing Ed Martin. 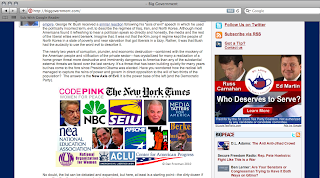 And now they have the audacity to go on national TV and complain about the IRS looking at tea party groups. One last irony from the Kulow video worth mentioning: another guest was an employee of Americans For Prosperity, the astroturf group funded by the billionaire Koch brothers. This raises an issue that I think hasn't been discussed enough as part of the IRS "scandal." People say it would be wrong for the IRS to target particular groups just because of their political beliefs, and this, of course, is true. But that isn't necessarily the only reason the IRS has for looking closely at the tea party groups. As most people know, the tea party wasn't as "spontaneous" as they liked to portray, and they received a lot of help and coordination from big-money backed groups, including especially the Koch Brothers' Americans for Prosperity. So if there's evidence that a number of groups are coordinating with one another or being coordinated while applying for 501(c)(4) status, and that some of those groups are flaunting the rules, then that seems to me to provide a reason for carefully looking at the groups, entirely independently of their political beliefs. Update: Several people are telling me that Wagman's claim that 501(c)(4)s "can't communicate their endorsement to the public at large" is based on a misreading. If that's true, then the tea party doesn't seem to be violating the post Citizen's United interpretation of 501(c)(4) rules, just operating in the murky actually-functioning-as-a-political-organization-designed-solely-to-win-elections-while-technically-following-the-law landscape that we already knew about. Update #2: Think Progress gets to the heart of the matter.